In Coding with mBot: Self-Driving Vehicles Activities Module, students learn to successfully program mBot to mimic many self-driving car actions. Self-driving vehicles are a hot topic that combines diverse issues ranging from engineering to federal regulations. While it may be years before you have a self-driving car in your driveway, you can use mBot in your classroom today! With our Coding with mBot: Self-Driving Vehicles Activities Module STEM activities you and your students will successfully learn to program mBot to mimic many self-driving car actions, including automatic lane changes and autonomous parking. As students progress through the activities they build upon their basic coding and troubleshooting skills. Coding with mBot: Self-Driving Vehicles Activities Module is free when you buy an mBot from Vernier. 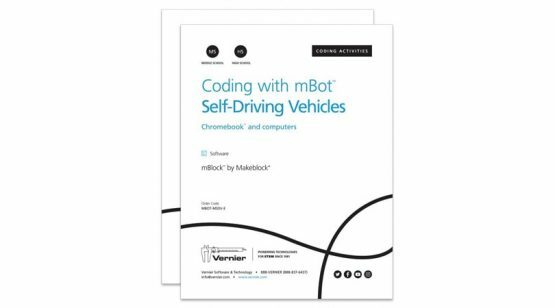 Coding with mBot: Self-Driving Vehicles Activities Module includes separate activities for different platforms. The activities listed below prefixed with “C” are intended for middle school and high school students using computers or Chromebooks. Activities prefixed with “M” are designed for elementary and middle school students using mobile devices, such as iPad or Android tablets. Click on an activity below to see the introduction, objectives, and correlated standards. Preview “Manual Drive” and “Teach mBot to Drive” activities. The previews include student instructions, instructor information guide, sample program code, and more. This book contains 40 experiments for physical science. The complete table of contents is shown below. Experiments are included for 9 Vernier physical science sensors in chemistry and physics. These experiments are perfect for introductory physical science and integrated science classes! Human Physiology Experiments contains 14 experiments designed to encourage students to explore the physiology of various human organ systems. The experiments in Human Physiology Experiments encourage students to investigate the physiology of the cardiac, muscular, respiratory, vascular, and nervous systems. Experiment setup is minimal—students are collecting data in minutes. Agricultural Science with Vernier contains a collection of 29 experiments that can be useful in teaching agricultural science at secondary school and sixth form level. Some experiments are designed to be done in the field and some in the classroom or laboratory. This book contains 10 hands-on, engaging wind energy experiments for primary students and a culminating wind energy engineering project. Study topics such as energy transfer, basic electric circuits, and blade variables, including pitch, shape, quantity, mass, and material through the use of KidWind MINI Wind Turbines and the Vernier Energy Sensor. The Renewable Energy with Vernier lab book features 26 experiments in wind and solar energy. The lab book contains a combination of explorations, traditional experiments, inquiry investigations, engineering projects, and more. In these experiments, students learn about renewable energy, experiment with variables affecting power output from model wind turbines and solar panels, and participate in engineering projects such as building a wind farm or a solar charger to meet certain design criteria.